Fresh water chestnuts are in the market for quite some time now. We have already enjoyed them boiled, stir fried and even raw just after peeling the tough skin. The husband loves these Singhada a lot in all it's forms. 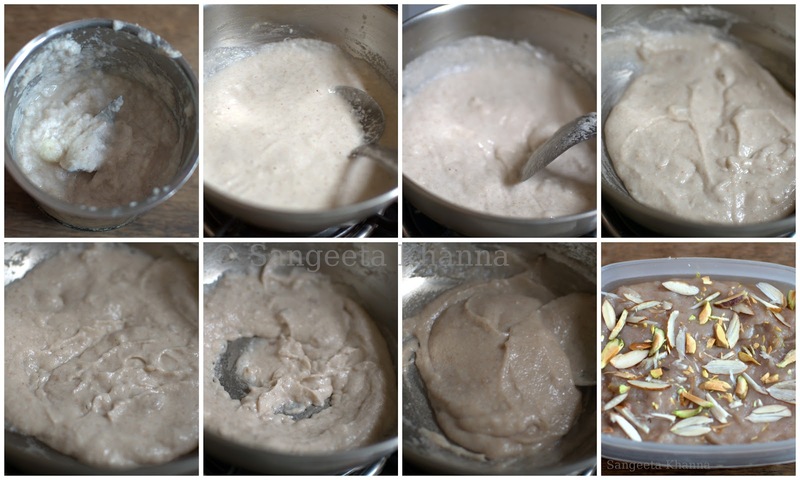 Keeping in mind his love for desserts, I make this kachhe Singhade ka halwa every season. This time I decided to make this kacche singhadeki katli and it is something I will be repeating many times. Even for visiting guests who love mithais. Let me tell you a secret before the recipe. The husband is so besotted by fresh (kaccha) singhada that he is ready to peel them on the weekends so he can get to eat them at least 3-4 times a week in season. So I stir fry the peeled singhada for him either in ghee and salt n pepper or with sprouts and sweet corn like this one. 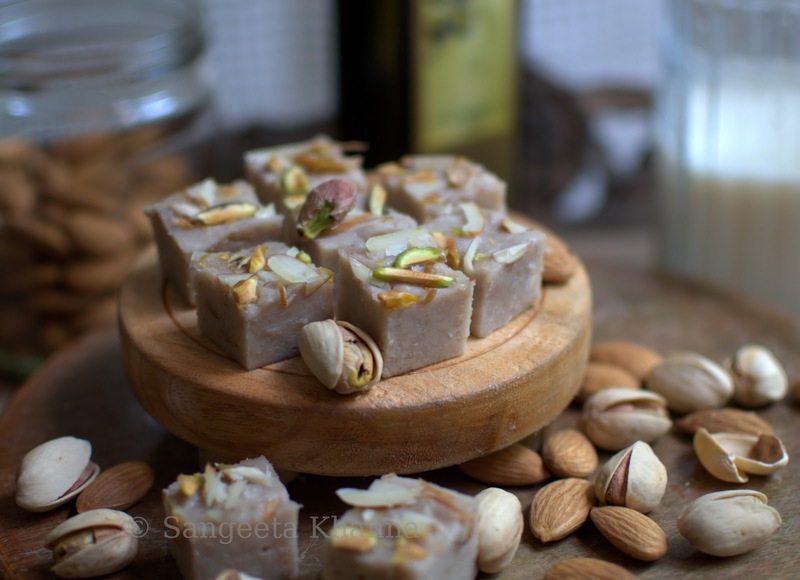 This singhade ki katli is a new entrant, the kachhe singhade ka halwa was already a favorite. 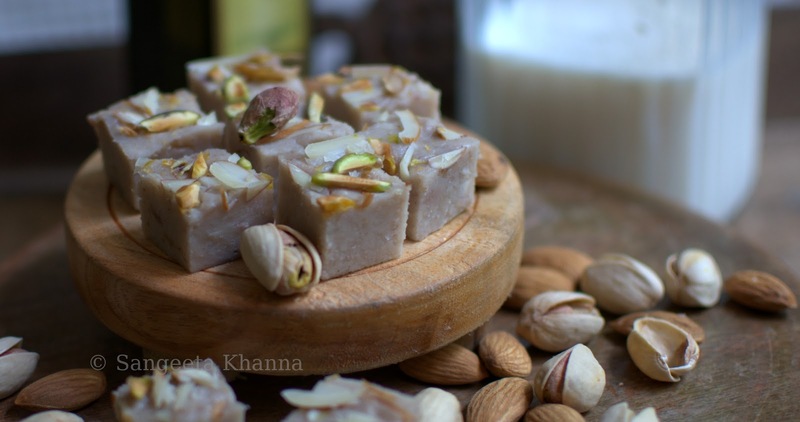 A Katli or halwa made using the dry singhade ka atta (water chestnut flour) is also among his favorites. These are a few things we have been eating since childhood. Simple foods that succeed in making us feel the warmth of home. This Kacche singhade ki katli is a 15 minute dessert believe me. Healthy and quick. Yummy you would know when you try this. Make a smooth paste of the raw water chestnuts in your food processor or mixie jar. Should make about scant two cups without adding any water. Heat the ghee in a wide pan (kadhai) and pour the water chestnut paste in it and start stirring with a spatula. See the picture in series. The paste changes it's consistency and color and starts becoming more glutinous, if I can use the word. No gluten content in it alright. Just when the cooking mixture becomes almost translucent and fragrant too, a very characteristic nutty aroma that I love, add the sugar and stir to dissolve. Pour into a greased square tin or container and spread chopped nuts over it and press the nuts so the embed properly.The container should be appropriately sized to get you thin or thick katlis (squares like fudge or brownie), so keep that in mind. Cut in squares when cool and remove from the container. Serve fresh and see if you can save some leftovers. Keep in a lidded container in fridge for about three to four days. I would recommend to serve it on room temperature as chilled katli tastes a bit blander than the room temperature version. This makes the best of Vrat ka khana recipes as it can be served to guests who are fasting. Happens a lot of times during Navratri. 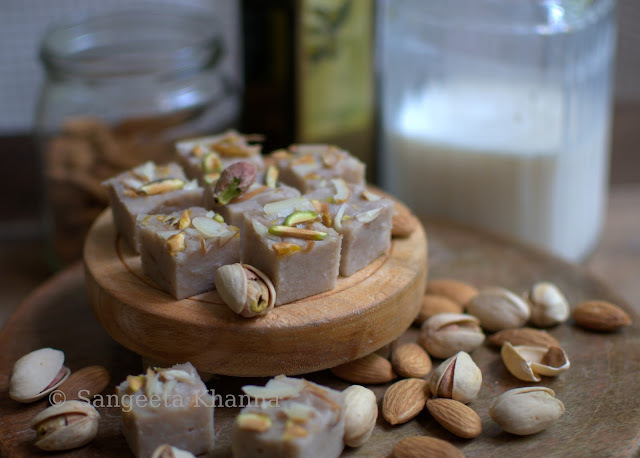 Many of my guests are already in awe of the sugar free or naturally sweetened mithai substitutes I serve. This Water chestnut flour, gluten free Panforte is one that brings me copious complements. This kachhe singhade ki katli is one more addition to such unusual, awe inspiring snack treats. the katlis are looking damn good. i don't get water chestnuts here but i remember back in delhi we would get them this season and i miss them. wow Sangeeta this looks like a real treat while fasting.. would love to try these super perfect :)! But this recipe is super simple and even i can make it. yay! Water chestnut is the that fruit we call singhara which has got thick green cover and the inside is white/cream in color? i would suggest you to add a picture of it too. Will update the post with a picture very soon. These are recipes that I don't get to see everywhere. Banaras ka khana does seem so interesting. Love the halwa.